I’ve recently discovered a groundbreaking cure for spots, which doesn’t involve antibiotics or harsh chemicals. In fact it only involves light, and has no side effects. The fact is acne affects a lot of people, some of whom are affected in adulthood due to stress, hormonal changes or just genetics. So this is a great way to combat the condition in a clean, effective and practical way. The OXY Clearlight is a hand-held device that when switched on shines a light that is a very specific wavelength, 415nm. It produces high levels of the singlet oxygen affecting only the P.acnes bacteria (the bacteria that is responsible for the spots) and not the surrounding healthy cells. This interrupts the development of the spots causing the P.acnes bacteria cells to die. To use the device, which is a bit like a small torch, place it on the spot and turn it on – it will stop after three minutes. It couldn’t be simpler. And, as part of the range, OXY have developed a skincare regime that prevents and supports spots, and contains a unique seaweed ingredient, purified int he cold waters of the Atlantic and harvested from sustainable sources off the coast of Britanny. The minerals, vitamins and trace elements found in seaweed work to help erode bacteria and calm redness. The products and the light device, have undergone extensive independent clinical trials, all of which show how effective they are. 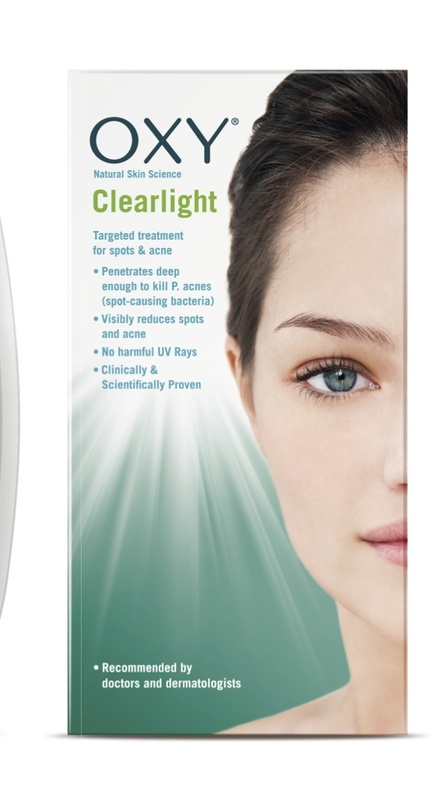 So if you suffer from acne or get spots regularly give this a go, it could really make a difference and solve – or at least manage – a problem that now has a very clear and bright solution. Available online at www.oxy.co.uk and Superdrug nationwide. This entry was posted in Skincare and tagged acne, fresh, glowing, healthy skin, OXY Clearlight, problem skin, spots. Bookmark the permalink. £39.99 isn’t a bad price for something that appears to be so successful, I’ve paid more for a cleanser in my time! I know! It’s fantastic and completely harmless and clean.